The New York Rangers begin their quest for the Stanley Cup as they open up the season in Madison Square Garden and they face-off against the Florida Panthers tonight. 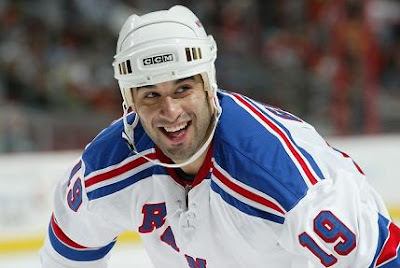 When the Rangers take the ice the “obvious” line combos – Gomez/Jagr/Straka and Drury/Shanahan/Avery – will not be taking the ice together, but that is fine Scott Gomez. 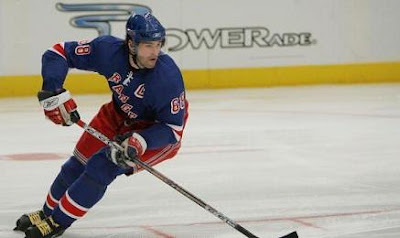 “To Start it off, I like to pass it and (Brendan Shanahan) likes to shoot it,” said Gomez in the NY Daily News. Just because Gomez and Jaromir Jagr are not skating together to start the season doesn’t mean the pair won’t be together soon. “We’re likely to be making changes on the fly in a number of areas as we get into the season and see what works and what doesn’t,” Rangers coach Tom Renney told the NY Post. The biggest question that remains unanswered is exactly how will Jagr adapt to not having the playmaker Michael Nylander there to feed him the puck? Chris Drury is not exactly the same type of player as Nylander was. He is more likely to shoot the puck than Nylander who often skated around for long periods of time waiting to setup Jagr. That is why Renney initially said it was obvious to pair Jagr up with Gomez who is known as one of the best passers in the NHL. Although I don’t think anyone is worried about the talented top line. “I think that right now, that line with Chris and Jags and Straka looks like it could be really dangerous,” Gomez said to the Daily News. As for the power-play, it looks like Renney won’t be breaking up his even strength lines. The top man-advantage line skating during practice was Jagr, Drury, and Petr Prucha with Martin Straka and Michal Rozsival at the points. The second power-play line gives a bit of a different look with Gomez, Shanahan, and Sean Avery up front and Fedor Tyutin and Dan Girardi at the points. “Our best success last year came when we had two units with distinct looks that received an equitable amount of time,” said Renney to the Post. The rest of the lineup is set as well. The third line which skated together Tuesday was rookie Brandon Dubinsky centering Ryan Callahan and Prucha and the third line will be a combination of Blair Betts, Colton Orr, Marcel Hossa, and Ryan Hollweg with one of them getting scratched. The defense is mostly familiar faces with Rosival and Marek Malik as the first pair, Tyutin and Girardi as the second pair, and rookie Marc Staal will make his NHL debut tonight playing with Paul Mara as the third pair. Thomas Pock will be a healthy scratch and could possibly start tonight if Mara is held out of the line-up. Of course Henrik Lundqvist will be between the pipes for the Rangers tonight. He is coming off of back-to-back 30 win seasons and he finished as a Vezina Trophy finalist in each of those seasons. Last year he got off to a slow start with a 3.57 GAA in October, but rebounded and was one of the best goalies in the NHL down the stretch with a 1.80 GAA after the all-star break. The team is hoping things start off more smoothly than last season which didn’t go well early and didn’t start winning until the February 5 trade which brought Avery over from Los Angeles. From that point on they finished the season 17-6-6 maddening opponents all the way to the second round of the playoffs. With acquisitions of two of the biggest free-agents on the market in Gomez and Drury they hope to go a lot farther this season. "I don't think there's anything wrong with talking about how we believe that we're good enough to win the Stanley Cup,” Avery said to the Post. “As long as we back it up on the ice each and every game." You can also read my articles at www.hotstovenewyork.com.